More Birds Vintage Bottle Hummingbird Feeder, 22 oz. Showcase antique style and lovely design in your bird garden using the More Birds Vintage Bottle Hummingbird Feeder. Ornate detailing throughout the textured glass reservoir easily captures attention, while the plastic, saucer style base provides a fantastic support for the item. The soft, green hue on the reservoir enhances the aged motif, and this bottle holds 22 ounces of nectar for several birds to enjoy. Raised lines throughout this vessel add extra style, while impressed ovals with ornate shapes and dots within them offer a finished look. The neck of this bottle threads into the plastic base, and five metal flowers here create feeding ports. An arch extends outward next to each port, for the hummingbirds to rest while dining, and the brown tone of the base perfectly offsets the red flowers. A metal hanger remains attached to the top of the bottle, for placing the feeder on a hook or bracket, and the item is easy to disassemble for cleaning or refilling. 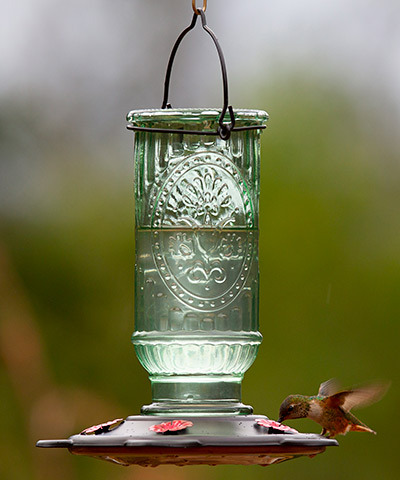 Bring a timeless hobby to the forefront of your yard with this Vintage Bottle Hummingbird Feeder. More Birds Vintage Bottle Hummingbird Feeder, Red, 22 oz. More Birds Garnet Hummingbird Feeder, 20 oz. More Birds Elixir Hummingbird Feeder, Red, 16 oz.